Under the auspices of the Council for Clean Capitalism, Corporate Knights recently released a first-of-its-kind quantification of the annual capacity for green bond issues in Canada. Working from a detailed assessment of relevant capital requirements and issuer debt-raising capabilities, the assessment yielded a figure of $56.3 billion in potential new green bonds in fiscal 2017/18 alone. Since we limited the scope of our assessment to just 21 of the country’s largest public and private issuers, the actual potential is no doubt considerably larger. It’s a stunning figure given that the most recent annual quantification of Canadian bonds formally labelled as green stood at a mere $1 billion. This $56.3 billion finding clearly dispenses with any remaining doubt about the potential for a sufficiently large and liquid green bonds market in Canada. And the benefits of capturing that potential could be massive. Green bonds – meaning those from which the proceeds are restricted to uses that address climate change or otherwise improve environmental outcomes – have a compelling value proposition for both investors and issuers. Most fundamentally, they respond directly to the various imperatives that are causing many institutional investors to seek increased exposure to low-carbon products – ones divorced from stranded-asset and other risks now linked to some traditional asset classes in Canadian markets. For issuers, they are an entry point into a specialized capital market in which investor demand typically outstrips investment-product supply, and where preferential financing terms (a “greenium”) may be available. Ontario’s experience has already demonstrated that green bonds enable issuers to tap into expanded and deeper pools of global fixed-income capital. Furthermore, they are a powerful mechanism by which governments can harness private capital to help fund ambitious infrastructure plans. This dovetails nicely with the ambitions of the new Canada Infrastructure Bank, which will focus on large, transformative projects such as regional transit plans, transportation networks and electricity grid interconnections – all eligible for green bond status. The Ontario government entered the green bond market in 2014, and now has three outstanding issues totalling $2.05 billion that are funding projects such as Toronto’s Crosstown LRT. Quebec entered the market several weeks ago with an initial issue of $500 million. The federal government is a natural candidate to follow suit and become the third national government to issue sovereign green bonds. Federal issuance of $2 billion to $3 billion per year would boost liquidity and offer a powerful signal to the marketplace that Canada is open for green bonds. This would help draw in the type of long-term green capital the government is targeting for transformative green infrastructure investments. 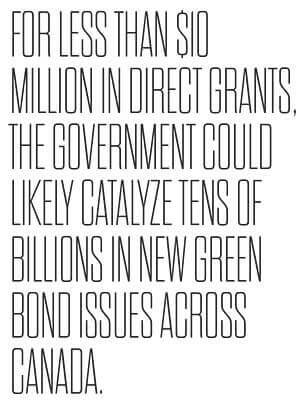 Simple self-interest makes green bond issuance a compelling proposition for the federal government, although there’s more it can and should do. Two specific measures are imminently implementable and have proven to be game changers elsewhere. The first would be to establish standardized national qualification criteria for a bond to qualify as green – striking the right balance between clarity, flexibility and alignment with emerging international standards. China’s early action on guidelines catapulted it to market leadership in a matter of months. It would be feasible for Canada to develop a green bond standard over the next three to six months, in advance of its entry into the sovereign green bond club. The second would be to offer direct grants that cover additional verification costs currently associated with green bond issuance. While usually nominal, these are a barrier to entry for many at this nascent stage in the development of the market. We estimate that for less than $10 million in direct grants, the government could likely catalyze tens of billions in new green bond issues across Canada. A recent program of this type on the part of Singapore’s government has received an initial positive reception in the market. In taking these measures, the federal government would also be positioning Canada’s financial industry for leadership in the green financing space. This is mission critical for our economy given that over half of TSX 100 profits are generated by the financial sector. The UN has estimated that global green capital flows of more than $90 trillion (U.S.) will need to be mobilized over the next 15 years. Moreover, global investors with $60 trillion at their disposal are already explicitly targeting the purchase of more green bonds. That’s an immense scope of activity, but given the still-early state of market development around the world it remains an open question as to which global financial centres will emerge as green bond centres of excellence. Issue-guide-grant. It’s a formula for federal action on green bonds that could set the stage for increased funding for our infrastructure needs, for meaningful reductions in climate emissions and for Canadian leadership in the growing global market for sustainable financing expertise. 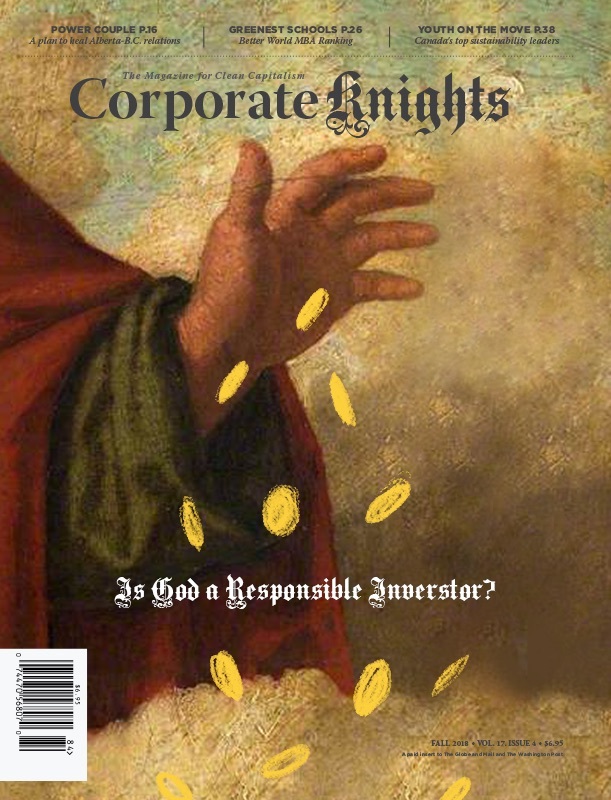 Research support for the Corporate Knights report – which can be accessed here – was provided by RBC Capital Markets.